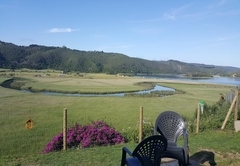 Waterside Lodge is a 4 star graded guest house offering Wilderness accommodation in 5 guest rooms. 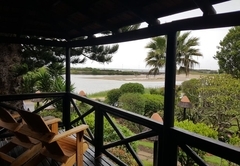 Overlooking the Wilderness Lagoon, Waterside Lodge offers accommodation to its visitors in stylish, comfortable and well appointed rooms. 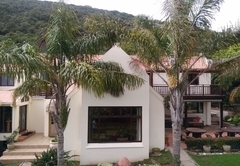 The establishment is within walking distance of the beach, the fresh water lagoon and the charming Wilderness Village. 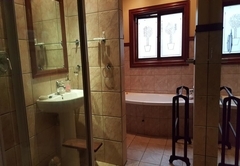 The B&B rooms have a private entrance, en-suite bathroom and wooden veranda. 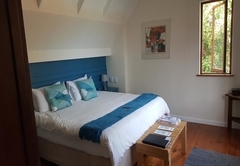 The Whydah Room is a spacious, well appointed room with views of the garden, swimming pool and river. 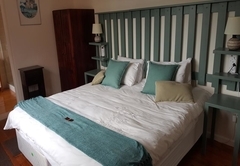 This unit boasts a comfortable King size bed and a neat bathroom with a balcony spanning the entire length of the room. 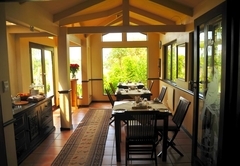 The room overlooks the lush garden with views of the lagoon and the ocean. It has a King-size bed, TV, fridge and a full en-suite bathroom. 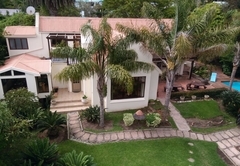 The room has a private entrance and has a patio next to the pool. 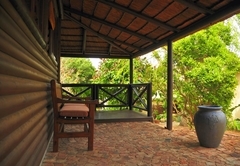 The Loerie Cabin is a thatched roof log cabin with an en-suite bathroom with shower. It has a King- size or twin beds, a TV and a fridge. 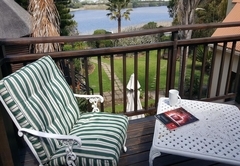 The cabin has a private entrance and wooden deck which overlooks the garden with ocean views beyond. 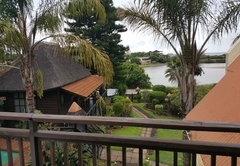 The Sunbird Suite is a large, freestanding thatched log cabin with a veranda. 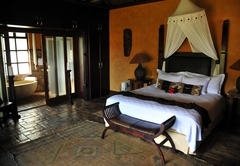 It has a King-size bed, reading chairs, TV, fridge and a large full en-suite bathroom. 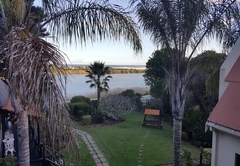 There is a separate entrance and great views. 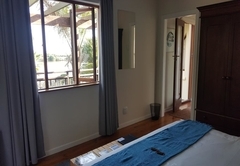 Situated on the second level of our house, this double room overlooks the pool and garden with excellent views of the lagoon and the Indian Ocean beyond. It has a King-size bed, a TV, fridge, tea/coffee tray and en-suite bathroom with bath and shower. 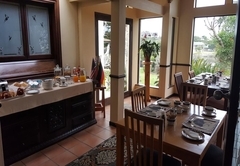 Breakfast is included in the rates and served each morning. 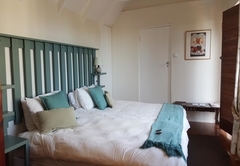 The Whydah Room is a spacious, well appointed room with views over the garden, swimming pool and river. 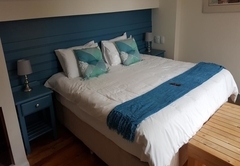 This unit boasts a comfortable king size bed and a neat bathroom en-suite, with a balcony spanning the entire length of the room. 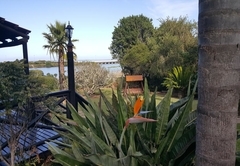 The room overlooks the lush garden with views of the lagoon and the ocean beyond. 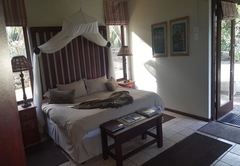 It has a king size bed, TV, fridge and en-suite bathroom with bath and separate shower. The room has a private entrance and has a patio next to the pool. 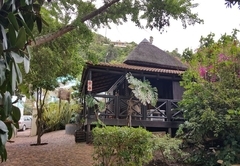 The Loerie Cabin is a thatched roof log cabin with en-suite bathroom with shower. It has a king size or twin beds, TV and a fridge. 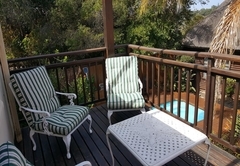 The cabin has a private entrance and wooden deck which overlooks the garden with ocean views beyond. 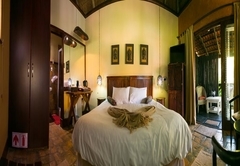 The Sunbird Suite is a large, freestanding log cabin under a thatched roof with veranda and offers a king size bed, reading chairs, TV, fridge and a large en-suite bathroom with bath and separate shower, twin basins. 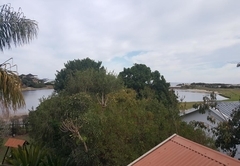 Separate entrance and great views. 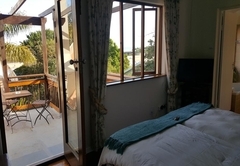 Situated on the second level of our house, this double room overlooks the pool and lush garden with excellent views of the lagoon and the Indian Ocean beyond. 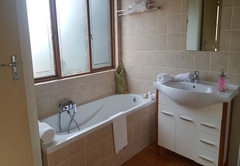 It has a king size bed,TV, fridge, tea/coffee tray and en-suite bathroom with bath and shower. Response timeWaterside Lodge typically responds to requests in 5-10 minutes.